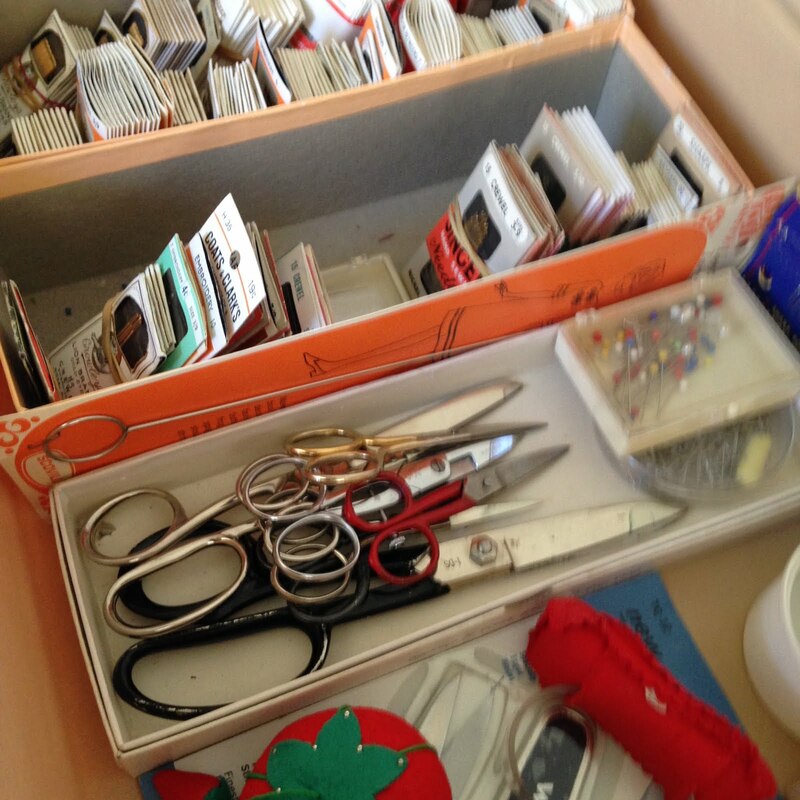 What is a Sewer without several pairs of scissors, lots of pins, needles and pin cushions? Then there are thimbles. . . and other tools I'm not quite sure about. I recognize the tracing wheel with the beautiful wooden handle to the left, but I'm not quite sure what the smaller awl like pieces are picture below? Perhaps they are for punching holes in leather? This was Olive Smith's favorite sewing machine. She would have purchased it brand new, despite the hundreds of hours spent on this machine, it still looks fabulous. This Singer was manufactured in September of 1956. I have one which is five years older and it still sews like a dream! Mrs. Smith liked to use her 401A Singer because it had a variety of stitches. It was manufactured around 1958. The cabinet that belongs to this machine is so beautiful! And last but not least, here are a few of the patterns she used to create clothing for her daughter, Carolyn. However, like many sewers, Mrs. Smith was able to create using a pattern and her imagination. Carolyn recalled fondly how she and her mother would go to the department stores and try on clothing. Carolyn would then tell her Mother, I like the top on that dress and the bottom on that dress, and then her mother would sketch out the dress in her notebook, take it home and create exactly what Carolyn wanted. Thanks for coming along on this sentimental journey! My mom was not the seamstress as Olive Smith, but I also would go with mom to a store. We did this for my prom formals. I'd try them on and when I found one we both liked, she'd go home and make it for me. I don't remember mom ever sketching the design, but I always had beautiful prom dresses and no one else had one like mine. Mom would also buy a pattern and make me 5 or so dresses using different fabric. Enjoyed looking at all of Olive's stuff - love her machines - and helping me to take a trip down memory lane. I had a parallel life to Mrs Smith, but she was so much better. I was a home economist for the extension service. I made all the same button hole samples. I had the same sewing machines. Used the same patterns. But she was a heck of a lot better than me and it is wonderful that it was all saved. I absolutely love a vintage sewing machine. I have more modern machines, but whenever someone asks me what kind of machine they should get I point them at a vintage Singer. Those can take a beating and just keep on going. I've pieced a couple charity quilts on my treadle so I don't just love them, I use them.